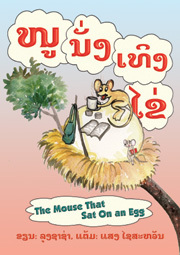 Will you sponsor a Big Brother Mouse book in Laos? Will you sponsor a book for Big Brother Mouse? Can you help us make books that are more affordable? Will you join hundreds of other book sponsors to get books to more children in Laos? Each sponsorship helps us publish one more book in a country where that's still a rare event. Here are details about how to send your sponsorship donation. Did you know that parrots who live in different regions develop different dialects? Our "I Can Read!" 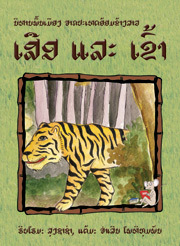 series teaches the Lao alphabet letter-by-letter. This book provides fascinating content for children who have learned only half the alphabet. Laos shares a border with five countries: Vietnam, Cambodia, Thailand, Myanmar, and China. This book will introduce both children and adults to our neighbors, with two or three traditional stories from each country, plus two pages of photos and general information about its history, culture, and traditions. These stories and personal essays were written by young people in Laos, including college and high school students. They represent the hopes, loves, and pain of young people in Laos today. 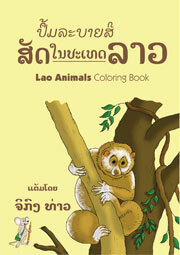 Add some color to the animals that live in the Lao jungle with this coloring book! 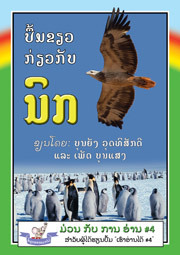 Every page features a different animal, with large drawings and interesting facts printed in Lao and English. Following in the grand tradition of Horton, a small mouse named Nuu-Nuu helps a lazy bird by sitting on an egg - for much longer than she had expected. She fills her days by reading, with time out to protect the egg from whatever threatens it. In the end, her efforts bring a welcome surprise. Can you help? Donations can be made be credit card, by bank transfer; in the USA and Australia you can send a check. Full details are on the donate page. Sponsors will get a thank-you both in the book, and on our website. If you prefer not to have your name appear, or would like to be listed in a particular way (as a business, for example, or with a partner's name), please let us know. A family tells Why we brought a book to life in Laos.